Review posted May 18, 2018. Roaring Brook Press, 2017. 36 pages. 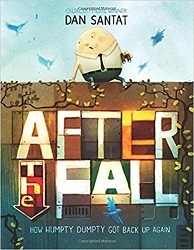 Here’s a lovely parable about Humpty Dumpty’s recovery. Humpty Dumpty’s favorite spot was high up on a wall, close to the birds. Folks called it “The Great Fall,” which sounds a little grand. It was just an accident. But it changed my life. After that, Humpty was afraid of heights. But he got an idea. He made a paper airplane, and painted it to look like a beautiful bird. But then, another accident happens (They always do. ), and Humpty’s bird got stuck on the top of the wall. I almost walked away, again. But then I thought about all the time I’d spent working on my plane, and all the other things I’d missed. I decided I was going to climb that wall. the more nervous I felt. But he keeps going, one step at a time, until he’s no longer afraid. This sounds simple, and it is – but the execution is brilliant. The timing of the page turns and the dramatic illustrations carry the theme beautifully. I love the page where Humpty reflects that his fear of heights is keeping him from enjoying some of his favorite things – the illustration shows a range of cereals, with gray, boring cereals on the bottom (names like “Fiber Flakes” and “Grown-up Food” and Humpty holding “Bo-Rings”), and bright, colorful cereals on the top (including “Rainbow Bites,” “Sugar Bunny,” “Just Marshmallow,” “Bowl-O-Cookies,” and “Free Toy”). The catch is the climax. It’s lovely and inspirational – you just have to not think about it too hard (which I have a big problem not doing). Humpty Dumpty hatches! Into a beautiful bird, and flies away! It’s lovely and wonderful and all about overcoming your fears and going on to soar. There are two problems that persnickety me can’t quite overlook. One is that if Humpty was an egg with a live embryo inside – that embryo wouldn’t have survived his fall. (I always thought he was hard-boiled.) The second problem is that birds can’t fly moments after hatching. But every other single thing about this book is beautiful and brilliant. You can rise again after unfortunate accidents and emerge better than ever.